I had no reason whatsoever to make this meal kit hack other than the fact that I’m enjoying hacking meal kit recipes and blogging about it. Hey, we all have our weird hobbies. 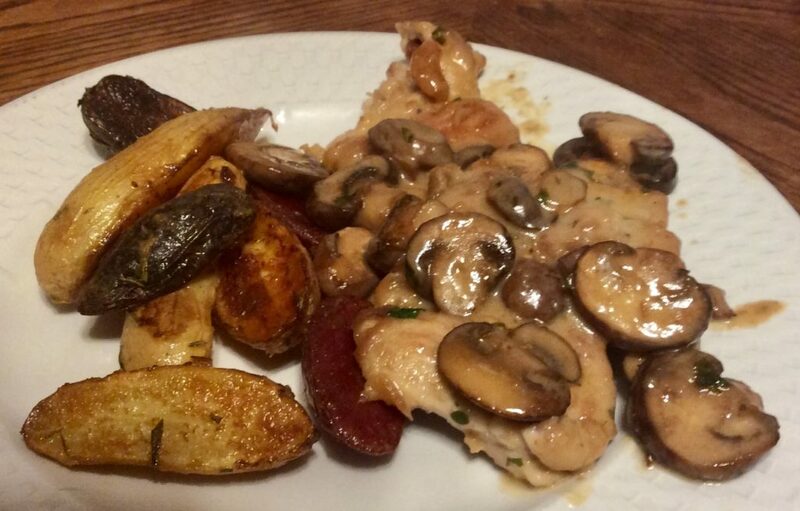 I did, mind you, need to use the rest of the skinless/boneless chicken thighs my husband got me by mistake a few days ago (the first half I used to make this meal hack) and I love Chicken Marsala, but I could have gone with my usual recipe – which is absolutely delicious. Granted, Plated’s recipe for Chicken Marsala is almost exactly like my own (this one doesn’t use shallots, though) – which is probably why this recipe was absolutely delicious as well. The recipe for the chicken, that is. I did not enjoy the fingerling potatoes at all. The Dijon taste was too weird. Maybe I put too much, I had to guess how much were in the “packets” and “containers” that went with the kits, but more likely it’s just not a good combination. I did make a couple of changes to the chicken recipe, the main one was that I used Madeira instead of Marsala. I usually keep Marsala around, but apparently I had actually run out of it the last time I used it. Madeira has very similar notes to Marsala, and I figured it would produce similar results. It did! If anything, the Madeira was better than the Marsala (or maybe, this is just a better recipe than mine). My local Safeway carries this kit often, and I would consider buying it. My big hesitation is that it comes with chicken breasts, when I really prefer thighs so much more. Cover each chicken thigh with plastic wrap and then pound until thin. Place flour in a bowl, season with salt and pepper to taste. Flour the chicken thighs and leave aside. Heat the butter in a large skillet over medium-high heat. Once melted, add the mushrooms, season with salt and pepper, and cook until golden, about 8 minutes, stirring frequently. Using a slotted spoon remove mushrooms to a bowl and set aside. Add olive oil to the skillet and heat over medium-high heat. Carefully transfer the chicken thighs to the skillet and cook until done, about 4 minutes per side. Remove to a clean plate and set aside. Add the Madeira, chicken broth and reserved mushrooms. Cook, stirring frequently, until the liquid is reduced by half, about 5 minutes. Stir in the cream, parsley and lemon juice. Reduce heat to medium and cook for 1 minutes. Return chicken to the the skillet and cook until the chicken is warmed through, about 5 minutes.